The hosts found themselves 1-0 down with ten minutes to play after a dreadful first 80 minutes. An incredible finish to a previously drab affair all but ended Swansea City's playoff hopes, whilst adding fuel to Nottingham Forest's dreams of a Wembley date in May. A youthful Swansea side dominated possession throughout the contest and finally took the lead through Connor Roberts' fortunate finish on 76 minutes. Yet two late goals converted by substitute Daryl Murphy and defender Molla Wague from identical Joe Lolley corners gave Forest a vital three points despite being second best for much of the game. Both clubs were able to welcome back their top goalscorers, after a poor run of form in their absence, with Lewis Grabban and Oli McBurnie boasting 34 goals between them this season before kick-off. Forest would have also been delighted to see captain Ben Watson back in the engine room after missing the last three games, particularly as none of his replacements really impressed in that position when granted an opportunity. However, the contest came too soon for Alexander Milosevic, so Molla Wague continued to deputise in defence after netting on his first Forest start before the international break. In contrast, Swansea were able to call upon the experience of Kyle Naughton, although Wayne Routledge missed out altogether, in a starting eleven that contained seven players aged 23 or under, including Daniel James who scored on his first international start for Wales last weekend. After a fairly subdued start to the contest, with Swansea trying to control the tempo through their patient short passing game, Forest had the first opportunity of note when a fizzed Joe Lolley corner was glanced on by Yohan Benalouane but the defender could not get the desired purchase on his header to test Kristoffer Nordfeldt. Moments later, another home corner, this time worked short to Matty Cash, was flicked over by Wague. 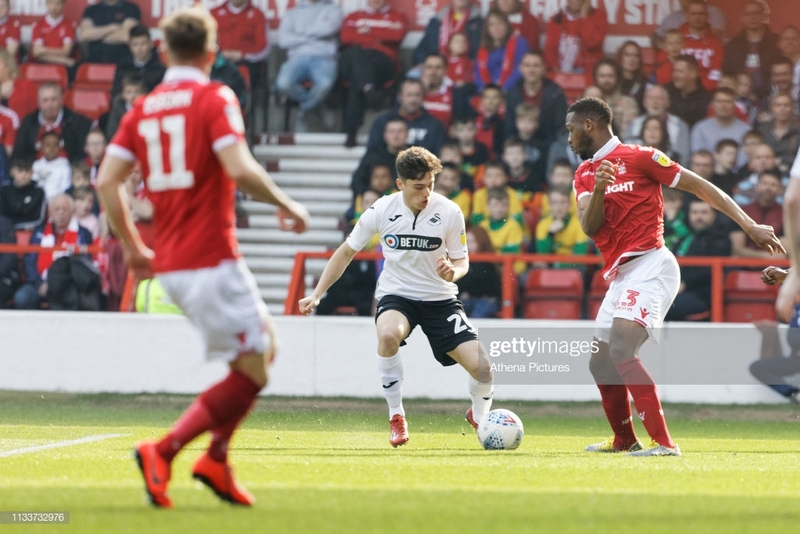 James was undoubtedly the outlet Swansea were looking for in the opening moments, his pace causing problems for Forest right-back Tendayi Darikwa. The Welsh youngster was close to unlocking the home defence on a couple of occasions before releasing Bersant Celina into space but the Man City loanee could only curl his effort straight at Costel Pantilimon. Swansea had quickly settled with Matt Grimes, fresh from scoring against Man City in their FA Cup near miss, dictating play from the base of midfield. Despite all of the talk of a playoff push in the matchday programme, Forest fans were unsurprisingly growing frustrated with their side's lack of possession in the opening 20 minutes. The visitors had clearly not been put off their stride by City's last gasp winner a fortnight ago, emphasised by goalkeeper Nordfeldt, who was outstanding in that game, comfortably slipping the ball through Grabban's legs two yards from goal. Yet for all of the visitors' pretty play in front of the Forest back four, they had struggled to get the ball to 18-goal man McBurnie. A bit of extra composure and quality required for the killer ball in the final third. It allowed Forest to keep their interest and Jack Colback, who the City Ground faithful are desperate to sign a permanent deal in the Summer, should have done better with a wayward rasping effort from range. Swansea continued to probe and they were close to finding the breakthrough when Mike Van Der Hoorn's clipped pass was inches too long for the run of Celina. The visiting captain was picking opportunities to venture forward, aware of the lack of threat coming his way from the opposing attack. Van Der Hoorn cruised passed a laboured Ben Osborn, deputising for the second time in three matches at left-back, before working the ball to McBurnie. The striker then tumbled to the ground in the box...only to be booked for simulation. Seconds later, Forest had loud shouts for a penalty appeal turned down after a possible handball from a dangerous long throw. As the half filtered towards stoppage time, Grimes unleashed an unfamiliar Swansea shot from range with only a deflection taking the effort inches wide. It all but brought to an end a half dominated by the passing of Swansea (70% possession) but with limited tempo to cause the Forest defence too many problems. There had to be an improvement from the hosts in the second half and they immediately showed more desire to get forward. The ball broke to the quiet Ryan Yates in the penalty area during the opening moments but he could only curl his effort high and wide from a relatively tight angle. Yates was soon replaced by Pele but there were still gaps to be exploited in the Forest midfield. Once again, Van Der Hoorn burst forward, releasing McBurnie to run at the defence. The penalty area opened up for the Scotsman but he could only curl his effort wide when he should have opened the scoring. All of a sudden, Forest were on the ropes. A whipped ball from the left found the head of George Byers but an outstretched Pantilimon parried the effort away. With the home side failing to clear their lines, a free-kick was giving away for a foul on the spritely James. Yet Celina could only find the hands of Pantilimon who had kept four clean sheets prior to the last two outings. The response was swift, Joao Carvalho and Daryl Murphy replaced Watson and Grabban shortly after the hour mark, the latter decision greeted by home jeers. If anything, Forest's best moments came from the continuous loss of possession from Nathan Dyer, the only survivor from the 2011 playoff semi-final between these two sides. His miscue in the penalty area fell to Lolley who lashed over in wasteful fashion. The attacking midfielder is one of just three Championship players to manufacture over 100 shots this season. With the home side looking to get forward following the introduction of Carvalho, further gaps were opening for the pacey Swansea youngsters to exploit. Celina was hacked down by Darikwa on the edge of the box but Grimes could only curl the free-kick over. Meanwhile, Dyer was quickly hooked with former Forest player Barrie McKay taking his place. However, with little over ten minutes remaining, Swansea finally opened the scoring. McBurnie laid the ball to Celina who cut back a cross to Byers. The midfielder volleyed towards goal, deflecting off the heel of right-back Connor Roberts, who was inexplicably positioned on the penalty spot, and trickling past Pantilimon. All eyes panned to the assistant referee but the flag stayed down as the defender was awarded the goal.. Yet the lead was to last just a couple of minutes as a previously drab affair exploded into life. A whipped corner from Lolley found the head of Murphy who planted the ball into the bottom corner. The man whose introduction had been greeted by negativity just several minutes earlier. Almost a parallel of Forest's equaliser, Lolley's corner from the right side found the head of Wague in a similar position to Murphy before sending a bullet header into the back of the net. Cue pandemonium. You could cut the tension with a knife. As the game entered five minutes of stoppage time, Van Der Hoorn went up front and could have done better with a header that comfortably dropped into Pantilimon's hands. This youthful outfit impressed with how comfortable they were on the ball, dictating play for large chunks of the contest. Yet there were times when they missed added experience in the ranks. Swansea could have put the game to bed if they had moved the ball quicker and they desperately needed someone to organise the defence after the Forest equaliser. You shouldn't concede the same type of goal seven minutes apart. Swansea's best outlet was on the left with James and Celina linking up with numerous one-twos in the first half. A bit more composure from the former will develop as James progresses but his final ball was left wanting. In the second half, the pairing continued to link and swapped positions, exposing the Forest defence to numerous drives forward. Yet keeping even one of the duo at the club in the Summer will be a challenge. It will be a worry for Martin O'Neil about how easily his experienced workhorses of Watson and Colback were outplayed by Byers and Grimes. Yes, they got the result, but if Forest are to mount a serious promotion challenge they need to plug the gaps in the middle of the park. Swansea went into the contest several places below Forest but dominated possession with 69% of the ball away from home.